Bannu Airport (IATA: BNP, ICAO: OPBN) is situated 6 nm (11 km) west of the city center of Bannu, in Khyber-Pakhtunkhwa province of Pakistan. It is not as large as other airports of Pakistan, as it is built to provide services to the people of Bannu and its adjacent areas. 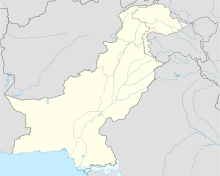 Currently (May 2008), Pakistan International Airlines does not have any scheduled flights to this airport. ^ Airport information for BNP at Great Circle Mapper. Source: AIP Pakistan. This page was last edited on 4 December 2016, at 10:29 (UTC).